News - Goulding features in Sheeran song? Goulding features in Sheeran song? The Lego House singer said that the track, which is about a girlfriend cheating on him with a mutual friend, is based on past experience, but stayed tight-lipped about the female's identity. "The story in Don't is 100 per cent true. I could have gotten nastier - there was more s*** that I didn't put in," he told Billboard. "I was seeing someone for a bit of time, and then they ended up physically involved with one of my friends in the same hotel that we were staying in, while I was downstairs. And I feel like: Treat people how you want to be treated." Ed and Ellie dated for a few months in 2013. The song sparked speculation that it is about the Brit-winning singer, because one of the lyrics read, "We make money the same way... You were looking for a lover to burn," in a possible reference to Ellie's hit, Burn. 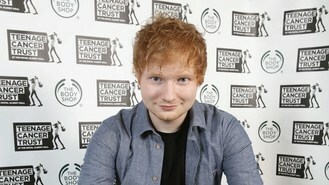 Ed remained unrepentant about the track, saying: "If you date a songwriter, be prepared to have songs written about you. If you do nice things, you'll have nice songs. And if you do f***ed-up things, you'll get a horrible song." The 23-year-old's second album X will be released on June 23. As well as Don't, it also features Sing, which was recorded with Pharrell Williams. "The last album was more young and dewy-eyed and innocent," Ed said. "I've still got very nice songs on this record. But some of them are bite-y."